The Neumann KH 810 is an active subwoofer with a single 10 inch bass driver and Neumann's High Definition Bass Management system. 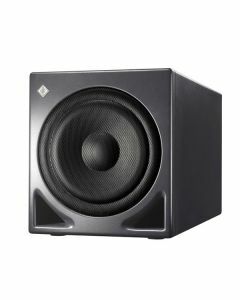 With its robust driver, rock solid cabinet and smart features this subwoofer will sit nicely alongside a wide range of studio monitoring systems. The Neumann KH 810 subwoofer is built to accompany Neumann's vast array of monitors. Intended to be utilised in music, broadcast, and post production studios for tracking, mixing, and mastering, the Neumann KH 810 will leave you reeling from its power. The sub has the capacity to be run solo or daisy-chained, making it possible to construct larger systems with the possibility of higher SPL. The cabinet can be set up adjacent or flush mounted to a wall thanks to the front mounted port. The KH 810 also has the ability to be mixed freely in multichannel systems with other loudspeakers from the range. The KH 870 provides a modern 7.1 High Definition Bass Manager, compatible with all standard consumer formats from mono through to the latest 7.1 HD systems. Eight channels of analogue inputs also guarantee the necessary adaptability for modern studios to function. Four-mode LFE-channel processing ensures connectivity across all formats and industries. Fourth-order crossovers and flexible acoustical controls permit for endless system integration. The latest amplifier tech and sonic components were utilised by Neumann in the KH870 to guarantee the most precise sound reproduction possible. Sturdy drivers, a robust cabinet and precision engineered ports ensure firm and expressive low frequency reproduction without colouration, even at high replay levels. Using the sum output, Plane Wave Bass Array (PWBA) techniques acoustically develops lateral consistency in the listening area. The bass extends down to 18 Hz. Infrasonic filter frequency; slope: 6.5 Hz; 12 dB/oct. 1x Supplement "Getting Started Quickly"